Tejana singer Selena was on the brink of blockbuster crossover fame when her murder at age 23 catapulted her into mainstream celebrity. Filmmaker Lourdes Portillo gazes beyond the tabloids and points a sensitive lens on the cultural sensation that emerged around Selena’s life and death. 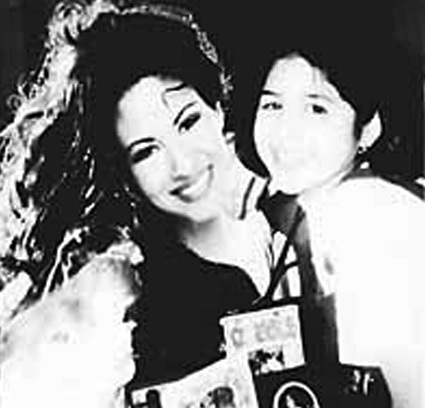 A compassionate collage that features starry-eyed teenaged fans, poignant interviews with Selena’s family, and lively exchanges with Latina intellectuals who debate her value as a role model. The film offers a fresh look at how this unique Mexican American voice still echoes in the hearts of her fans. Mexico-born and Chicana identified, Portillo’s films have focused on the search for Latino identity. She has worked in a richly varied range of forms, from television documentary to satirical video-film collage. Portillo got her first filmmaking experience at the age of twenty-one when a friend in Hollywood asked her to help out on a documentary. Portillo says: ” I knew from that moment what I was going to do for the rest of my life. That never changed. It was just a matter of when I was going to do it.” Her formal training began several years later. An apprenticeship at the San Francisco NABET (National Association of Broadcast Engineers and Technicians) led to a job as Stephen Lighthill’s first camera assistant on Cine Manifest’s feature Over, Under, Sideways, Down. In 1978, after graduating from The San Francisco Art Institute, Portillo used American Film Institute Independent Filmmaker Award monies to create her internationally praised narrative film After the Earthquake/Despues del Terremoto, about a Nicaraguan refugee living in San Francisco. The Mothers of Plaza de Mayo, the result of a three year collaboration with writer/director Susana Munoz, was a pivotal film in Portillo’s career. Its nomination for the Academy’s Best Documentary in 1985, and the twenty other awards it received internationally earned Portillo the PBS funding she needed for her next film, La Ofrenda :The Days of the Dead. Completed in 1989 and greeted with widespread critical acclaim, La Ofrenda was Portillo’s most serious attempt to date to challenge the notion that as she says “documentary is always associated with injustice.” In it she portrays in loving color a Mexican and Chicano holiday – the celebration of “the days of the dead” – and initiates the dream-like structure that has become a hallmark of her recent work. A grant from the NEA Inter-Arts program allowed Portillo to commemorate the 500th anniversary of Christopher Columbus’s “discovery” of America in her own ironic fashion. Her 1993 film, Columbus on Trial showed at the London and Sundance Film festivals as well and was selected for the 1993 Whitney Museum Biennial. In 1994 she was awarded a Guggenheim fellowship in recognition of her contributions to filmmaking. All of her work is widely shown in classrooms and academic circles and integrated into curriculum studies. Portillo has collaborated extensively with noted directors Susana Muñoz and Nina Serrano and with Academy Award-winning editor Vivien Hillgrove. Working with other women artists has helped Portillo break down the proscriptions of traditional documentary making because “women, and women of color in particular, often come into filmmaking with a different set of objectives than their male counterparts.” Portillo’s films have received high praise at more than ten international women’s film festivals. In The Devil Never Sleeps, Portillo continues her effort to explore the Mexican psyche, and broaden the spectrum of screen representation of Latinos and Chicanos. Her tireless creative impulses are meanwhile driving her in new directions. Currently in production is a narrative feature about a modern day Don Quixote: a filmmaker whose life and art become a beautiful hallucination and in her quest for the perfect film she gets lost along the way. The journey itself becomes her redemption and eventually her transformation. Ms. Portillo is also the executive producer for a low-budget comedy set in the urban underworld of cockfighting.